Private Lessons are offered to CHEERLEADERS and GYMNASTS of all ages and levels.  GIVES YOU THE EXTRA ATTENTION THAT CREATES AN ADDED EDGE IN YOUR TUMBLING SKILLS. Don't forget all-star cheerleaders and gymnasts receive a 40% discount on all their tumbling classes, so tumble on!!!! If you are enrolled in a private, you also receive a 40% discount on a second tumbling class. Recreational gymnastics is both beneficial and fun for children of all ages. During class, students use all muscle groups while learning skills and having fun. It is a great activity for developing strength, flexibility, balance, coordination, spatial awareness, confidence, and self-esteem - enhancing the ability to perform most other sports. In this day and age when too many children do not get enough exercise, gymnastics is the best activity to provide a total fitness program. einforcing good basic technique. Strong emphasis is placed on body awareness and safety. One of the objectives of Premier is FUN! Of course, this is cool with the kids, but parents sometimes don't always agree. Your preschooler can learn and have fun. At Premier we realize the importance of fun in a learning setting, especially for preschoolers. Adults often feel that when fun is present, learning is not. Nothing could be farther from the truth. Why is fun so important? All well - adjusted, life long learners at some point during their formative years formed a subconscious association when presented with a learning situation approximating: Challenge = Risk = Learning = fun & excitement! On other words, a challenge is worthy of my best effort in and of itself. The value of this association becomes even more apparent when inspecting the opposite association that is prevalent in today's teenagers and young adults: Challenge = risk = failure = fear & anxiety. For a person possessing this negative association the pain of possible failure is simply not worth the risk. This person then learns to insulate themselves from their fear and anxiety by creative, clever excuses and displaying apathetic attitudes about "trying" such as: "who cares?" or, "why should I even bother to try, I'll never be able to get it anyway". O.K...now that you know a little more about the substance of Premier, we have a favor to ask. SHHHH!...Don't tell the kids: They think Premier is just pure FUN! At these ages, the social skills of sharing, helping others, and listening politely are as important to learn as gymnastics skills. Gymnastics classes are typically the first experience with a "school" setting. These classes cater to the children's need for social development as well as movement education. At about age 4, progressions of challenging skills for vault, bars, beam, tumbling, and trampoline are presented. The teacher may "spot" the child during skill performance for safety and learning purposes. Safety is foremost with all age groups. With an increased attention span, and improved strength and flexibility, gymnastics skills are acquired more easily at this age. Skills, drills and strength are stressed in this tumbling class to help develop tumbling skills and jumps utilized in competitive and non-competitive cheerleading, gymnastics and dance. Our Gymnastics and Tumbling instructors work with athletes of all age levels to enhance their performance and increase their competitiveness. This class is for tumblers ages 5 and up and will be working on Back-handsprings Round-Off Back Handsprings and Back Tucks. This class is designed for Premier students who have mastered their intermediate tumbling skills. Skills, drills and strength are stressed in this advanced tumbling class to help develop tumbling skills utilized in competitive and non-competitive dance, gymnastics and cheerleading. Our Gymnastics and Tumbling instructors work with athletes of all ages to enhance their performance and increase their tumbling skills. This class is for advanced athletes ages 7 and up and will be working on fulls, layouts, doube fulls and double backs. 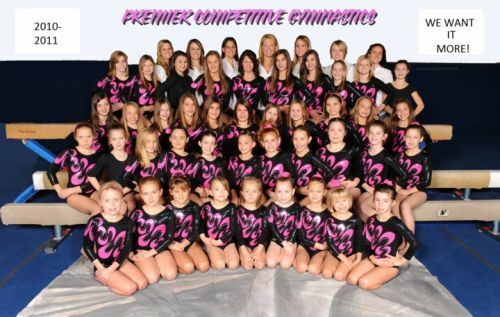 Premier Gym offers a competitive gymnastics program for kids who have exceeded the skill levels of our classes and wish to compete. Our competitive program is a progressive program where the students develop strength, flexibility, and basic gymnastics skills in a structured, disciplined, yet enjoyable and fun atmosphere. We offer a safe, fun, age appropriate environment for each child to develop skills at their competitive level. Our mission here at Premier is to build healthy, happy, responsible children offering them a positive experience they can benefit from throughout their lives. The skills of tumbling, swinging, balancing, jumping, rhythm, agility, eye-hand coordination are all included in our daily gymnastics workouts. Some of the psychological qualities that are developed through the sport of gymnastics are: high self-esteem, physical courage, determination, perseverance, expressiveness and self confidence. All interested gymnasts skills will be evaluated in order to be considered for the team. Competitive Gymnastics levels begin with Pre-Team and compete through the high school level. If your school does not have a competitive team and you train at Premier, you will be able to compete at the High School level as an independent. 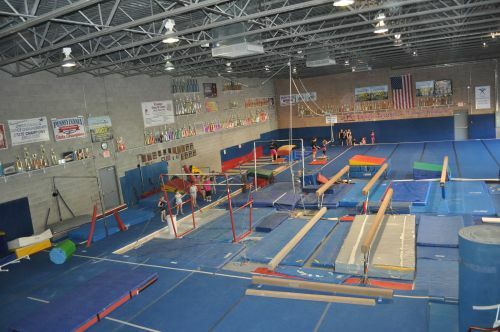 Participants compete against various gymnastics schools within the Pgh. Area. Our "Open Gym" is extra practice time and completely supervised. This activity is for children, age 5 and older, to either practice skills they are working on in class regardless of level or for non-members and new visitors to experience our facility and the joy of gymnastics in a great atmosphere for learning. "Open Gym" will be held every Saturday 11-12:30. Non-Members and members are welcome! The cost is $5.00(Members) 10.00 (Non-members). Fees are to be pre-paid prior to entering the activity area.